Teachers from Seattle, Issaquah and Mercer Island held a strike Tuesday to pressure lawmakers to increase school funding. Meanwhile, some lawmakers criticized the walkouts, saying they want to dock teacher pay for skipping school, prompting Democrats to leave a hearing about a GOP-favored bill to punish teachers for strikes. 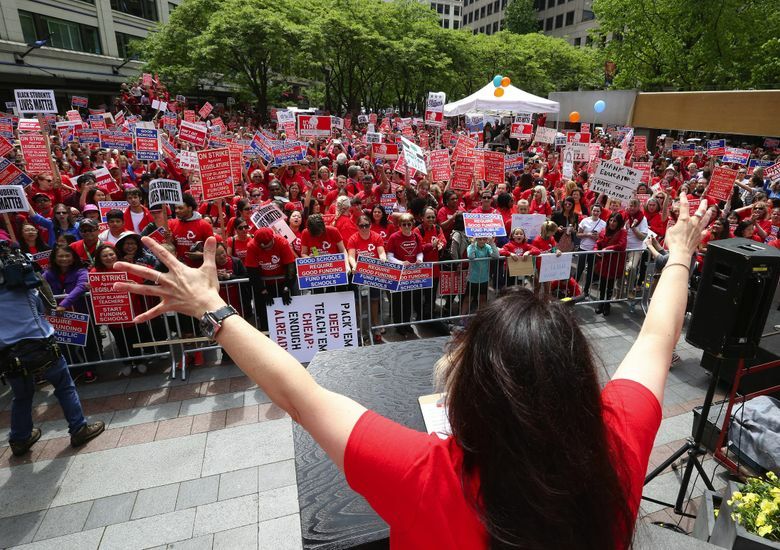 Thousands of public-school teachers filled Seattle streets on Tuesday in a one-day walkout that caused tempers to flare in Olympia, where Democratic senators walked out of a hearing over a Republican-favored bill that would punish teachers for such strikes. The teachers from Seattle, Issaquah and Mercer Island were just winding down their noontime rally when the hearing in Olympia got under way and Democrats on the committee left the room. But the hearing went on anyway, with the remaining lawmakers speaking out against striking teachers. And though many argue that the law on teacher strikes is ambiguous, Sen. Michael Baumgartner, R-Spokane and chair of the committee, said he believes they are illegal. 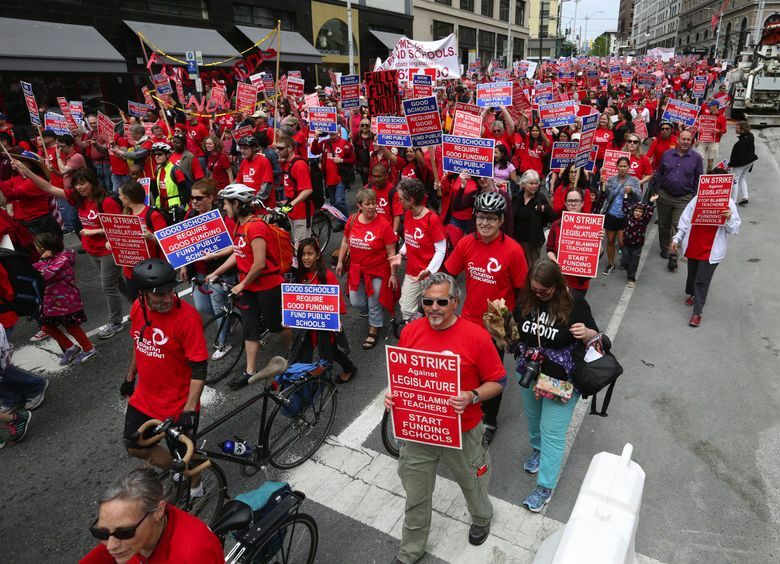 Legal or not, the teachers turned out in the thousands Tuesday, filling downtown Seattle streets as they marched from Seattle Center to Westlake Park. Police blocked intersections and escorted at least 2,000 teachers, parents and students, who chanted and cheered as they walked, carrying signs. Some played drums and rang cowbells. Garfield High Latin teacher Wayne Miller strummed a banjo. 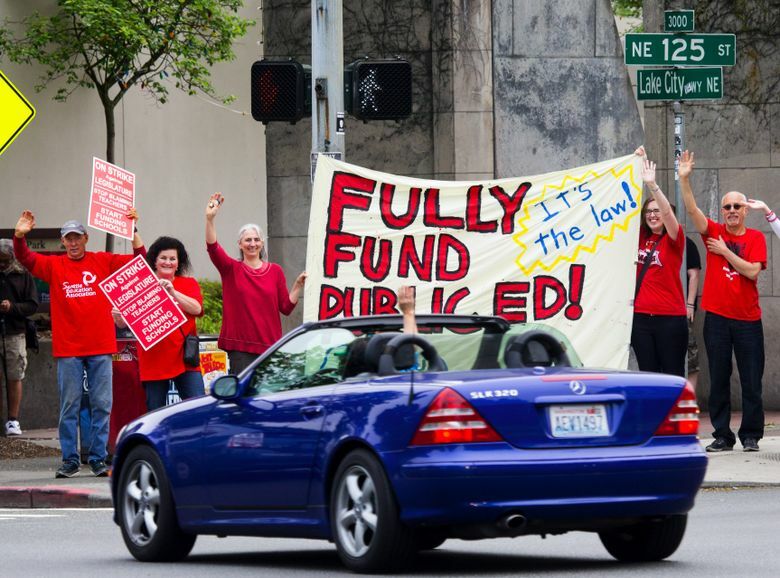 Teachers also want lawmakers to fulfill the requirements of the state Supreme Court’s McCleary decision, the ruling that said state legislators are shortchanging students by not providing as many dollars to public schools as the state constitution requires. Last fall, justices found lawmakers in contempt for not making enough progress to fully fund schools. “We’re not asking for anything the law doesn’t already require,” said Theo Moriarty, a seventh-grade teacher at Hamilton International School in Seattle. During the rally, some teachers also mocked lawmakers for receiving an 11 percent raise over the next two years while proposing much smaller pay increases for teachers. Three City Council members — Kshama Sawant, Tim Burgess and John Okamoto — joined the march, too. Marina Pita, a teacher at Concord International School in Seattle, said there’s not enough money in her school’s budget to provide adequate classroom supplies, so teachers reach into their own pockets. “We’re out there buying pencils,” she said. Pita said lawmakers should take note of the nearly 60 districts across the state that have held or are planning one-day walkouts. Jeff Randolph, an English teacher at Mercer Island High School, said of all the teachers’ gripes, class size was most important to him. His largest class is 31 students, he said, which makes for a lot of essays to grade. During the march, Randolph pushed a stroller carrying daughter Esme, 1, with one hand, while passing out pamphlets on how to contact lawmakers with the other. 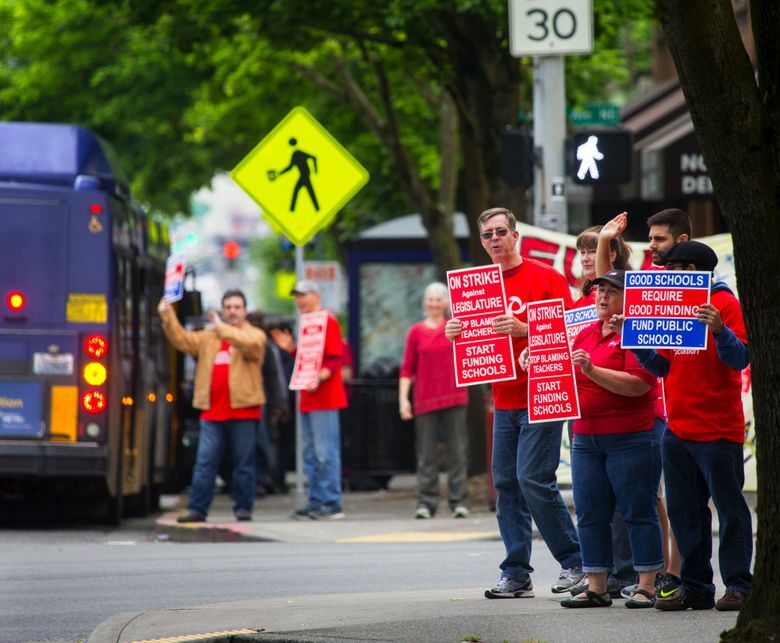 Tuesday’s hearing wasn’t the first time Republicans in the Senate have expressed dismay over Washington teachers’ one-day strikes, which started in late April. School districts have taken striking teachers to court and won. During a 2009 strike in Kent, for example, a judge ordered fines for teachers who refused to return to work after about two weeks of protests. A 49-day strike in Marysville in 2003 — the longest-ever on record in Washington — also ended after a back-to-work order from a judge. McKenna and others point to a state law tucked into a section on collective-bargaining rights that reads: “Nothing contained in this chapter shall permit or grant any public employee the right to strike.” That’s partly what McKenna relied on in 2006 when, as the state’s attorney general, he wrote an opinion in which he said state and local employees — including teachers — do not have a legally protected right to strike. But the Washington Education Association (WEA), the state’s largest teachers union, says McKenna’s opinion is not law, and that the statute he cites doesn’t apply to teachers, who are protected under a different set of laws. Without a law prohibiting or allowing strikes, they remain lawful, said WEA spokesman Rich Wood. 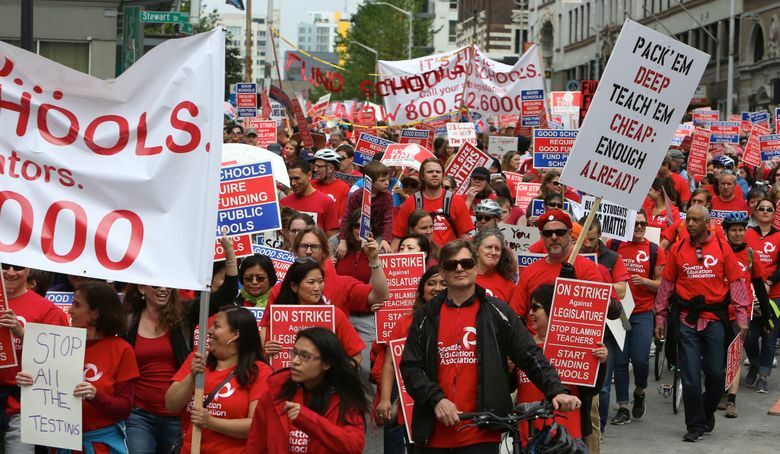 And while some contracts — including Seattle’s — explicitly say the union will not “cause or encourage” teachers to strike, the WEA says there’s a difference between striking against a district and against the Legislature. 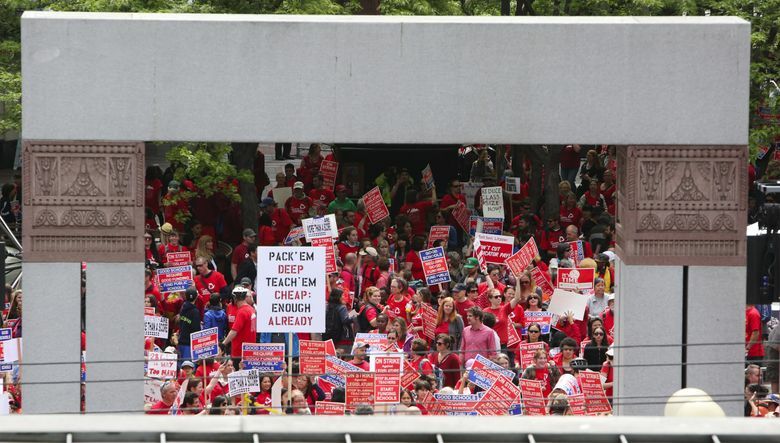 Many say the law regarding strikes is too ambiguous, including Bill Keim, executive director of the Washington Association of School Administrators. The teachers won’t lose any pay, because the walkout days will be made up at the end of the school year. And no school district appears to be putting up much of a fight. “With a one-day walkout, it would virtually be over before they could even get the paperwork filed,” said Keim, of the school administrators association.